Volvo chose to put a stake in the ground on safety. FedEx became the company everyone knew would get their package wherever it needed to be — on time. How have you chosen to be different than your competition? There are many terms used to describe this important concept — competitive advantage, unique value proposition, brand essence, brand promise, differentiator, etc… We call it a signature strength. The key is not in what you call it, but that to increase the value of your company over time, you need to identify how you are different than your competition in ways that are meaningful to your customers. Assess whether or not you’re on the same page with your team on this critical question using our signature strength checklist. And if you’re interested in how we can help you prepare for this year’s strategic planning, click here for a description of our workshop, Are You Ready? 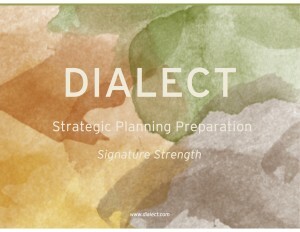 Getting Aligned Before Your Strategic Planning. P.S. If you’re worried that you don’t have an effective competitive advantage, you’re not alone. I’ve travelled around the country leading workshops and no matter what the size of the company or the industry, CEOs are often embarrassed that they don’t have a better answer to this question. If you want to talk about your answer, feel free to give me a call.